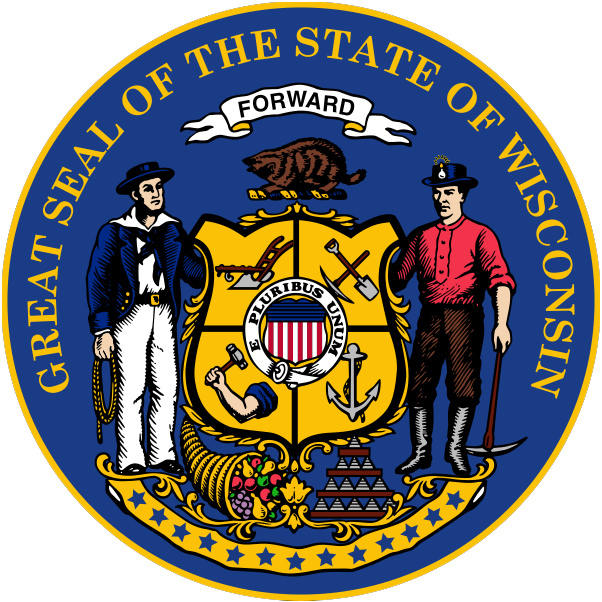 Great seal of the state of Wisconsin; public domain image on Wikipedia. 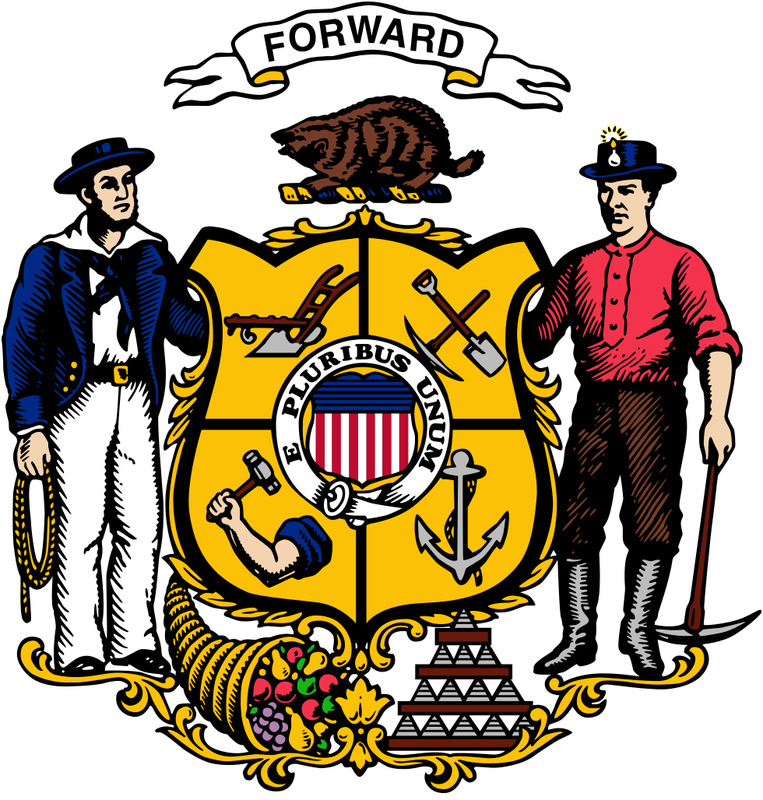 The banner above the shield displays Wisconsin's state motto: "FORWARD." Directly below this is a badger (the state animal). Supporting the shield are a sailor and a miner (the two most important industries of the state at the time it was founded). The center of the shield features the United States shield and the motto "E Pluribus Unum" (one from many). The pick and shovel are symbols of the early lead mining industry; galena (lead ore) is the state mineral of Wisconsin. The mining of lead ore was the principal occupation of the settlers of early Wisconsin, concentrated in the southwest corner of the state (in what are now the counties of Iowa, LaFayette and Grant - in the 1820's and 1830's, the population of these 3 counties was greater than that of Milwaukee or the east coast of Wisconsin). A plow represents the farmers and agriculture of Wisconsin; an arm and hammer represent Wisconsin's artisans and laborers; and an anchor is a symbol for Wisconsin's sailing and shipping industry. The western edge of Wisconsin is the Mississippi river (the chief shipping lane of mid-America during the early 1800's) and the upper part of Wisconsin is bounded by Lake Superior (source of the shipping trade for eastern Wisconsin). Below the shield are a cornucopia - a symbol for the plenty of the state, bars of lead representing Wisconsin's mineral wealth, and 13 stars which symbolize the original thirteen states. 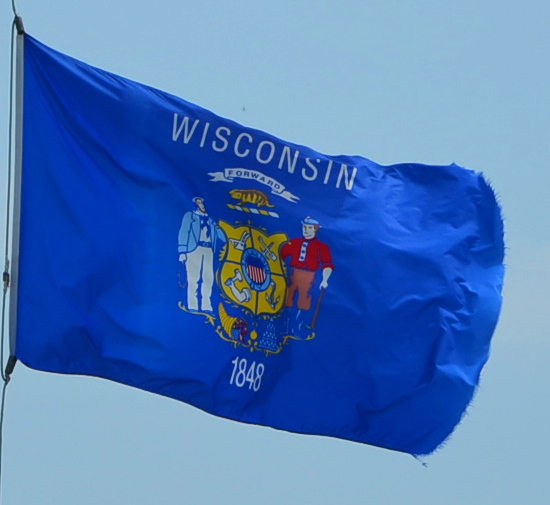 Wisconsin state flag flying in the breeze; photo by photo by Adam Fagen on Flickr (noncommercial use permitted with attribution / share alike). Wisconsin's coat of arms; displayed on both the Wisconsin flag and state seal. Photo by Svgalbertian/Wikipedia (public domain image). Historic Seal of the Territory of Wisconsin from 1847 book on American History; Text preceding the image: "In the foreground is a man ploughing with a span of horses: the middle ground is occupied by a barrel, a cornucopia, an anchor, a sheaf of wheat, a rake, and a pile of lead in bars—the latter, the most important of the mineral products of the State. The two great lakes that border the State—Lakes Michigan and Superior, have their representations; on one of which is seen a sloop, and on the other a steamboat—and on the shore an Indian pointing towards the latter. In the distance is a level prairie, skirted, on the horizon, by a range of woodland, and having on the left a Lighthouse and School Building, and in the centre the State-house of Wisconsin. In a semicircle above are the words: Civiiitas Suecessit Barharmn, Civilization has succeeded Barbarism. 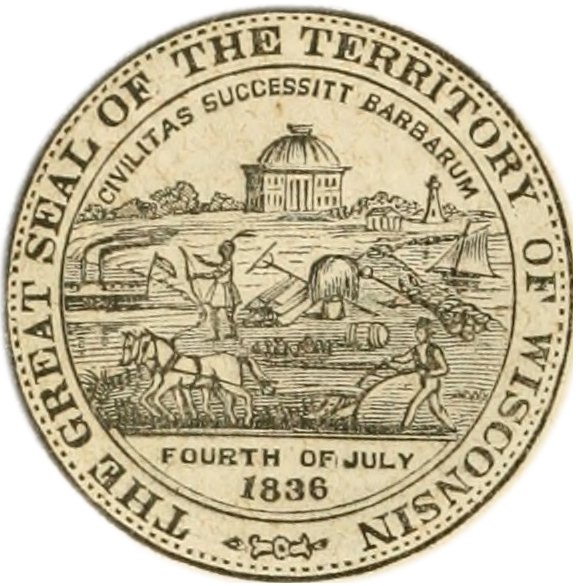 At the bottom of the Seal is the date of the formation of the Territorial Government, Fourth OF July, 1836, and around the Seal, in Roman capitals, the words, The Great SEAL of the Territory of Wisconsin." Photo by Internet Archive Book Images/Flickr (public domain image).